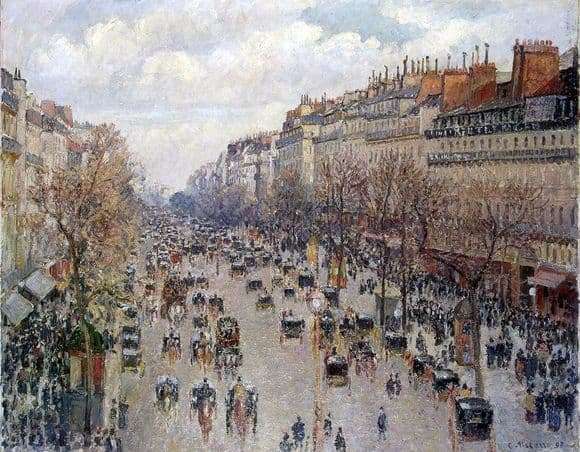 Impressionist artist, Pissarro, gave a lot of effort to art. He portrayed nature and the world around simple and alive. For him, the impressions of what he saw were important, which made the artist paint the same landscape several times. He depicted the terrain at different times of the day and was eager to convey the changes brought about by the change of seasons. Particular in this regard was a series of drawings depicting the boulevards of Paris. Pissarro retreats from tradition, refusing to paint monuments of architecture and so widely known in the world. He is eager to convey the real life of Paris, portraying the city as the environment of human existence. “Boulevard Montmartre” attracts with its liveliness. By the transfer of life through the movement and the artist sought. He avoids the usual gray and soft tones in the image of Paris. His life beckons, which boils on the boulevard, perpetual movement of people, which confirms the progress of all mankind on the way to the future. The boulevard, like the city, is shown crowded and pulsating, causing associations with the movement of blood in the human body. Movement is life. Movement stops – life stops. Captured by the movement of the boulevard, the viewer no longer thinks about the ordinariness of the image. The restlessness that the artist conveys on the canvas constitutes a special atmosphere of charm. One feels the admiration of the author himself from what he saw, but the ability to reflect not only what he saw in the picture, but also the attendant feelings is striking. A series of paintings will present the boulevard at all times to the viewer’s eyes: in the morning mist, still quite sleepy, sun-drenched and immersed on a rainy day, in the late afternoon twilight and under the light of the stars. The boulevard always remains charming and lively able to surprise the artist and the viewer. A clear and understandable motive allowed achieving a clear composition: the streets that go into the distance and do not change from drawing to drawing.